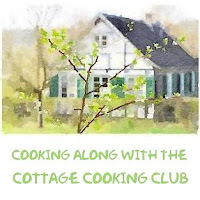 We are now officially in our second year of the Cottage Cooking Club; a group of international blogger's cooking together and then posting our experiences along with the Hugh Fearnley-Whittingstall's cookbook, "River Cottage Veg". Our group is meant to be a project aimed at incorporating more vegetable dishes in our everyday cooking, and is and has been inspired by our dedicated leader Andrea of The Kitchen Lioness. Andrea picks one recipe from each of the chapters. This month I prepared 3 of the 10 recipes and was again very pleased with each one. The first dish I prepared was the summer couscous salad. For the grain I used quinoa which was one of the suggested main ingredients. In this dish sweet peas, zucchini that has been fried with a little olive oil and halved cherry tomatoes are dressed lightly. The dressing is made with the juice and zest of a lemon, olive oil, garlic, salt and pepper. I took this summer couscous salad to a celebratory trail party and it was a big hit. The hint of the fresh lemon made this dish sing with the other fresh vegetables, another big winner in my book. The second dish was runner beans with tomatoes and garlic. In this recipe Hugh has you grating tomatoes which I quickly realized was an easy and functional way to peel them. In a large skillet chopped onion is sautéed until soft, garlic is added; then the green beans and tomato pulp. The beans are covered and simmered about 10 minutes or until tender. This dish can be served hot, warm or room temperature. For me the preparation of this dish was very unique as I usually always throw my beans in salted boiling water for about 5 minutes and then put them in an ice bath. My husband and I both enjoyed this dish and we had the green beans cold the next day as part of our lunch. Summer stir fry with fried rice was the third and last dish. The veggies I used were chard, peas, edamame, zucchini, green onions, ginger and garlic. The recipe instructs you to prepare the veggies first. So I prepped the veggies, set them in separate dishes and in the meantime started the rice. Since the my wok is in Arizona I used a large heavy skillet over medium-high heat and sautéed all the veggies this way. After the rice is done it is cooked with a mixture of an beaten egg, soy sauce and sesame oil, delicious. Next time I will left the rice char to get a more rich flavor. Very happy with this dish. Recipes adapted from the River Cottage Veg, by Hugh Fearnley-Whittingstall. First recipe; from the chapter "Hearty salads" Summer couscous salad" (page 89). Second dish from the chapter "Side dishes" Runner beans with tomatoes and garlic” (page 375). Third dish from the chapter “Pasta and rice” Summer stir-fry with fried rice (page 286). To see what recipes the other members chose for this month, head over to the LYL post for the July 2015 on the CCC website, by clicking here. Hi Charlie, yes, the fried rice is definitely a family favorite along with alot of recipes in this cookbook. Thanks! Cheri All look really delicious!!! Cheri, I also made and liked the Stir-fry - the "all-green" Stir-fry. However, I just served it with simple white rice and didn't make the effort to make the fried rice. Since I will make this again, thank you for the tip about charring the rice for a richer flavor. I'm glad you liked the Couscous (Quinoa) salad. Kathy wasn't particularly enamoured with it so I was hesitant to put it on my To-Do List. I am always looking for salads like this that I can take for lunch when I'm on patrol and hiking. I get so damn hungry and grain salads are filling. Kathy didn't use all the spices in the recipe which she thinks was a mistake. So I will follow along carefully and hopefully will like it as well as you did. You all made the runner beans - must try. BTW, my wok is in storage so I just used a big fry pan also. Worked fine. Hi Mary, the runner beans were delicious and really opened my eyes about shredding tomatoes. I will be making the cucumber salad as soon as mine are ready from the garden. Have a great week-end! Yes, that grating the tomato halves is a fabulous technique! All your three dishes looks great! Have not used my huge wok much since we bought more than five years ago, its been sitting on top of the fridge! Hi Emily, yes I love that technique too! Love how Hugh makes preparation so easy. I always love fried rice but those beans look mighty good, Cheri! I really must look into this cookbook! Hi Abbe, this is one of my favorite cookbooks, love it! 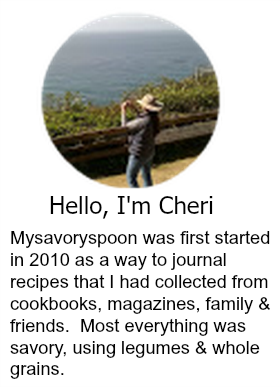 Cheri, nice to see the three recipes that you chose this month! They all look delightful! Thank you for participating in The Cottage Cooking Club again! Delicious August recipes are coming up soon! Can't wait to see our options for next month Andrea! So far this summer has been great. Hi Dena, yes I do too, I try and make most of our meals mostly veggies, but sometimes it's very hard to do. I love green beans and tomatoes together - but never tried grating the tomatoes - very interesting! Looks like another great cooking club month! Hi Tricia, yes it was another great month, I really enjoy that it is all about veggies. great way to use up stuff I grow in the garden. Hi Cheri, great to see you. Your dishes look terrific and I prepared each of the same dishes as well this month. I liked the summery combination on top of the stir fried rice which is popular in my house though I added more soy sauce than called for, along with sesame oil. Your green beans look terrific and I like the use of the quinoa. Looking forward to seeing you over the month, hope you have continued to enjoy your summer. Hi Peggy, yes another great month, I added more soy and sesame oil too, we like lots of flavor. Having a great summer, sounds like you are as well. Take care! Cheri, all 3 dishes look lovely! I made two of the same ones--the stir fry and the beans--and agree that they were all tasty. I'll have to try that summer couscous. I also loved loved loved that tomato grating technique--who knew?!? Enjoy the end of July and beginning of August! That was a great technique wasn't it. You really went all out yourself. All in all I thought it was a great month. Take care! Thanks Tandy, great way to enjoy summers bounty. Never thought about how grating tomatoes is a great way to peel them! Definitely going to try that. Love all 3 of these dishes -- I keep saying this, but I need to get that cookbook! Thanks for the inspiration. Hi John, it is one of my favorite books, it really is good. And the tomato tip is pricessless. All of your dishes look wonderful Cheri, and it sounds like they were all a hit. I didn't make the couscous dish but using quinoa as a substitute is such a good idea and I love the sounds of that simple dressing with those lovely vegetables. See you next month! Hi Zosia, I thought the lemon dressing was simple but just the right taste, not to tart. I think my favorite was the green beans. All three of these dishes sound great. I like that you used quinoa for a salad and it's a great make-ahead. Tomatoes and beans are so good together - the technique of grating the tomato is so interesting. And a fried rice with all those vegetables is another I'd love to try. Great recipes! Thanks Monica, I was pleased with all three of these dishes especially pleased with the tomato technique. I love a good quinoa salad. They are always so filling. Thanks Dannii, couscous was actually used in the recipe by Hugh, I used quinoa as that was another grain suggested by him. They all look like delicious summer dishes, Cheri! Hi Susan, they all were very summer time meals, loved them all. Have a great week-end! This sounds like a fun group to be a part of. I haven't seen this cookbook but from the recipes you share and discuss I'll have to check it out. I hope you've found that you're eating more veggies now than ever. Hi Vicky, yes, we definitely are and enjoying it to. Thanks! Thanks Liz, we enjoyed all three as well, very flavorful. I know Kim who knew what an great idea, that's whats so great about sharing. Take care! Still a wonder and a disappointment why your posts don't get to me..thank goodness I can catch up..that zucchini butter looks so good too! Thanks Monique, I have the same problem with some blogs too, not sure why? I love grating tomatoes. It's so fast! And, that's a great tip that it's an easy way to peel them. The fried rice looks good. I have to try it! Thanks Lisa, I always learn so much following your blog. Green is GOOD for you. I love all 3 simple yet very delicious summer dishes, Cheri. Thanks Angie, Yes! green is the way to go for me. Thanks! Great recipe full of Summer harvest goodies, I love how fresh and gorgeous it looks! Oh my goodness, Cheri, everything is so fresh, healthy and wonderful! I have never grated tomatoes but I will definitely give it a try. I love that you added lemon to the first dish - it always takes a dish over the top, doesn't it? I love that these are quick and easy. You are always opening my eyes to new ideas. Thank you! Thanks Robyn, have a nice week-end! Cheri - these all sound so perfect (minus the garlic! :) for summer. I hope you are enjoying the cool weather! Great monsoons here yesterday! Hi David, the PNW is in a drought this summer and it's only rained once since we have been here. Heard the monsoons have been great this year. All three of these recipes seem like they would have so much flavor. I really like the idea of grating the tomatoes, but never would have thought of it. It seems like it would spread the flavor out more evenly in the green beans. I also love that the stir fry has sesame oil in it - one of my favorite ingredients. Great choices, Cheri! Thank you for sharing them. Thanks Shari, this cookbook is the best. Great choices, Cheri. I am intrigued by the grating tomatoes technique. I didn't chose that recipe so wasn't introduced to it until I started reading CCC posts. I'm going to have to try that. I'm feeling virtuous and healthy just be reading your post! Happy August! Thanks Betsy, I think that tomato technique is such a great idea. Happy August to you too!